Fran remembers her days riding the Forest Park Carousel, which re-opened last week. Courtesy: Forest Park Carousel flickr. 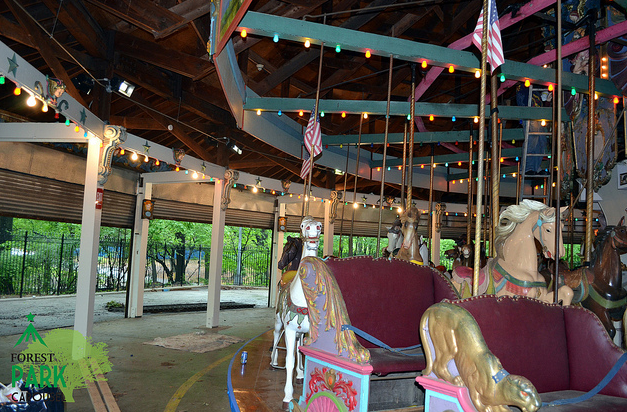 I read this week that the Forest Park Carousel was reopening for the season after several years of being still. I drive past it often and each time I am reminded of my childhood. Despite my status as a Brooklyn girl, I was really born in Ozone Park, Queens (don’t hold that against me.) We rented an apartment from my father`s sister, who took over the house that was purchased in the 1920`s by my paternal grandparents. The years in Queens were the beginnings of wonderful memories in my life and our visits to the Forest Park Carousel were very special. I can remember our yearly visit to Forest Park. My mother prepared for the event, packing the picnic basket. We did not go on vacations – just one trip to Louie’s Lakehouse – but we did go on picnics. My mother would cook thin steaks in a pan on the stove. She would send my father to the bakery for fresh Kaiser rolls and she would put the steaks in the rolls warm. She would wrap them up and put in a freezer pack, so the food would not spoil. Mom would then pack a bag of Wise potato chips and a thermos of lemonade – fresh squeezed, of course. My mother would put in a box of cookies, usually Oreos or Chocolate Chip It was exciting to get into the 1954 brown and tan chevy and ride over to Forest Park. You could see the carousel from Woodhaven boulevard, and I could hear the music and became so thrilled. But there was a procedure to the day which would always begin with the playground. My sister Maria and I would go on the slide over and over again. On the swings, my father would push us as high into the sky that we could get. The see-saw was a little tricky, since I was a very, very skinny kid and my sister was a little “healthier”. It became a little uneven on the see-saw until my dad would give my side a little push, so I would not be stuck on the top forever. We would run and chase each other and laugh until our sides hurt. Then my mother, who had brought a tablecloth and dishes, would set up one of the wooden picnic tables for our lunch. Food tasted so much better outside after playing. We would eat the sandwiches, chips and cookies and wash it all ‘down with the deliciously sweet lemonade. Maria and I knew that after lunch, we would get to the whole point of the day, the CAROUSEL! I loved to stand and watch the Carousel turn and then I would silently plan for the horse I would sit on. Sometimes it was confusing, since the horses were all so magnificent and majestic. I loved the different poses of the horses. In my imagination they were all real and I could almost hear their snorts. My father would hand the ticket over and we would wait as the carousel slowed down to a stop. The horses would be at rest as the group of children rushed on to make their selection. I would head straight for the horse I had mentally selected and struggle to climb on it. Sometimes, my father would have to lift me up and then strap me in. He would leave and slowly the music would fill the air. The horses began to move slowly up and down as the carousel turned around and around. The beautiful colored lights seemed to dance as we went around and I would hug the pole with one hand and with the other, I would wave to my parents, who beamed from the sides. As the music slowed, the horses seemed to tire and then they rested and stopped. I wanted to stay on it forever, but my father would come to take off the belt and help us down. Still excited, we would head for the car to make the short trip home. Sometimes, if there was a Good Humor cart my father would get us all ice-cream. As I would eat the chocolate eclair, (my favorite) I would look longingly at the carousel and wave a little to bid the horses a sad farewell. The carousel was magical and my memory of it will always be that of a child`s eye view of the world spinning round and round with the caliope playing in the background. I’m happy more Queens (and Brooklyn) kids will get the chance to ride around like I did, decades ago.